The female cycling community is small yet mighty. It’s women questioning routine and finding the courage to be uncomfortable whilst discovering more about the world and themselves. 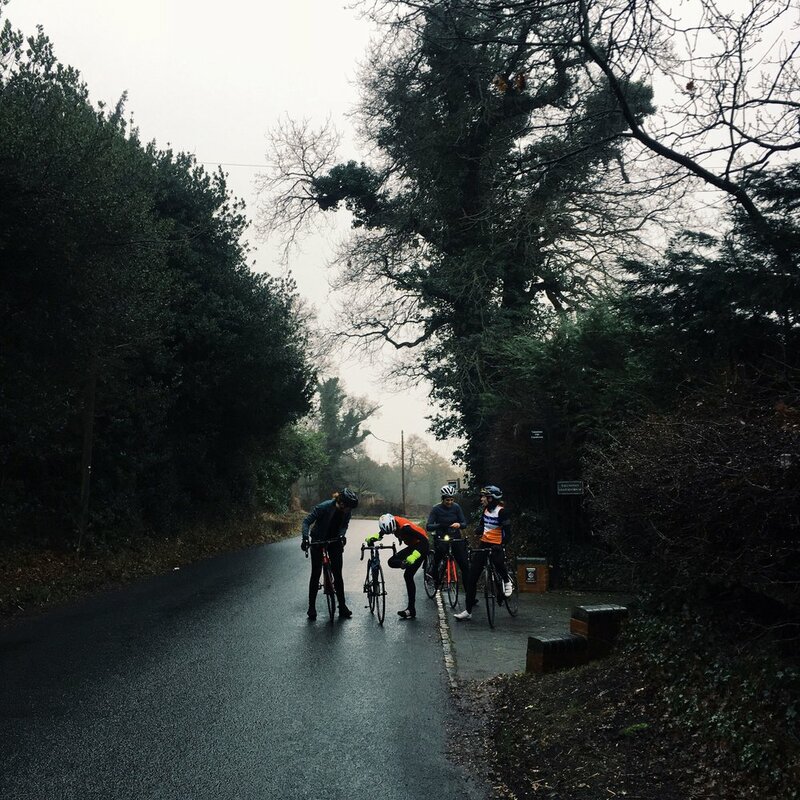 Over three consecutive days - Regents Park with The 5th Floor girls, racing at Hillingdon against Cat 4 women and a 70km Hertfordshire loop with Sarah - I was reminded that these ‘normal’ women are anything but, and are experiencing life in a way that deserves to be heard. Whilst London was sleeping, we were riding to Regents Park. Sitting on the top tube waiting for the traffic lights to change, I spotted Sophie, knowing she’d beat the cold weather, inner demons and the end of week exhaustion to be there. It was the same excitement as when you used to knock for your friends, but instead of ‘after school’, it was ‘before work’ playtime. Squad assemble. We were riding laps, two abreast. I was next to someone I’d never met before, discussing ambitions for racing and plans for the year. Meeting and making new friends as an adult is tough. We deem it too daunting or embarrassing (coming from the world that thinks Tinder is perfectly acceptable). Cycling breaks those barriers. I heard about the morning routine everyone had to honour to make sure they could complete training whilst getting to work on time. Prioritising, and finding purpose, from their 0600-0900 not just their 0900-1800. We rolled up to Workshop Coffee, faces covered in mud, taking over the seating area as we began unlayering and pausing our Wahoo GPS devices. It’s comrarderie courtesy of caffeine, whilst commuters look on with confusion. I'm sure they were thinking 'Is that the cycling equivalent of the Taylor Swift squad? !’ Yes. But this is one squad where anyone is welcome. I turned up to the race surrounded by women unpacking their carefully assembled race bags. From food in tupperware to chamois cream we hope hadn’t exploded, a silent kudos is shared appreciating the success of making it to the start line amidst all the internal and external barriers. The unglamorous toilets set the scene for last minute faff. One of the women helped me as I struggled to pin my number on (good start KPP). A humbling act of consideration before competition. During the race, we worked together to bridge the gap between the rider who attacked. A moment where complete strangers have each others back, and the unspoken thank you (a nod of the head) connects you with humans in a unique sporting way. The post-race adrenaline high gives you permission to be positive. We shared compliments and congratulated one another on an experience only we had shared. I met Sarah for a Hertfordshire ride. It was cold and it was early, yet we’ve trained ourselves to accepting this as normal. Surrounding yourself with great people expands your view on the world, and suddenly you realise your new ‘normal’ is much more than that. We took turns on the front, supporting each other when we were both depleted and broken. Experiencing these extreme emotions on the bike makes us more caring people off the bike (which hopefully balances out the ridezilla that appeared when I was hungry and pathetic half way up yet another hill). An endurance style breakfast of eggs, avo, mushroom, tomatoes and toast finished the ride. Instead of exchanging pointless gossip, we exchanged the salt and pepper and ideas for our next ride. Cyclists may suffer, but it results in moments of deep gratitude and contentment. An emotional pattern that becomes addictive amongst those that have experienced it. Women change the world daily. They can often be unsung heroes, with full time jobs, who are finding time to better themselves and reduce the distance between other females. It’s a vast world but when we ride together it’s a friendly one. So to the female superheroes, the wild ones with wardrobes that can sometimes prioritise lycra over the little black dress, your strength is infectious and I’m proud to spend these moments surrounded by you all. Keep riding, keep finding and keep saying no to being normal.